Provide comfort for the family of Claude J. Violette with a meaningful gesture of sympathy. Claude J. Violette, 92, of New Britain, CT passed away at home on Wednesday, March 20, 2019. He was clear eyed, and his mind was sharp till the end. Claude was born July 30, 1926 in Van Buren, ME to Estelle (Bosse) Violette and Vital Violette, one of 8 children in a tight knit rural community. He went through local schools, enlisted in the US Navy during WWII, and was deployed to the Pacific. At the close of the war he returned to the US and attended college to study engineering at Tri-State College, Angola, IN. He then returned to the Van Buren area and worked as a surveyor. In November 1952 he married Rita (Therriault) Violette and eventually had 5 sons. In the early 60’s he moved to New Britain, CT where he raised his family and worked as a machinist for Fafnir Bearing into the late 80’s before retiring. Claude was blessed with great faith. His family and friends will treasure his intelligence and curiosity for the world. He relished new perspectives on life and cultivated his mind by studying widely. Claude brought warmth to his home with a playful spirit – he could always be trusted to tell a joke, play a game, or weave a story from the past. Family was of the utmost importance to Claude, and he actively kept in close contact with siblings and extended family, quickly becoming a favorite to all. He was a friend of Bill for close to 50 years, a humble man with great strength. His glowing personality was the result of deep faith before adversity – he will be honored in memory as a great listener always with a kind word, a quick-witted sharp-tongued funnyman, and above all a man with a twinkle in his eye and a love for life. His spirit will be missed. Claude is survived by Rita, his wife of 66 plus years and four sons David Violette and his wife, Nikki of New Britain, James Violette and his wife Loretta of Southington CT, Patrick Violette of Plantsville CT, and Steven Violette and his wife, Nancy of Westport, CT. He is also survived by seven grandchildren who he loved, Kylee, Luke, Sarah, Noah, Michael, James and Anna Violette. Claude was preceded in death by all seven of his siblings, his daughter-in-law, Donna (Godici) Violette as well as his son, William Violette. Funeral rites for Claude will be held Monday, March 25, 2019 with the procession departing at 10 a.m. from the Paul A. Shaker Funeral Home, 764 Farmington Ave., New Britain, CT. followed by a Liturgy of Christian Burial at 11 a.m. at St. Jerome Church, 1010 Slater Rd., New Britain, CT. Burial with full military honors for Mr. Violette will be rendered by the US Navy in St. Mary Cemetery, 1141 Stanley St., New Britain, CT. Relatives and friends may call at the Paul A. Shaker Funeral Home; Monday from 8:30 a.m. to 10 a.m. Directions to funeral home – I-84 East or West, exit 37 (Fienemann Rd) right off exit – one mile down on right. Please share a thought or memory of Claude with the family at https://shakerfuneralhome.com/book-of-memories/3777997/Violette-Claude-J./index.php Memorial contributions can be made to St. Jerome Church 1010 Slater Rd., New Britain, CT 06053. To send flowers in memory of Claude J. Violette, please visit our Heartfelt Sympathies Store. We encourage you to share your most beloved memories of Claude J. here, so that the family and other loved ones can always see it. You can upload cherished photographs, or share your favorite stories, and can even comment on those shared by others. The Rossitto Family, Tim & Christine Kelly, and others have sent flowers to the family of Claude J. Violette. We send our Condolences & Prayers to the Violette Family & Friends of Claude. He enjoyed when we gave him some of fiddleheads and fish to him & lovely wife Rita. We enjoyed their kindness as they stop to say hello while taking their walks. He will be missed. C'est homme bon.🙏❤ Neighbors Celine & Dean LeBlanc. 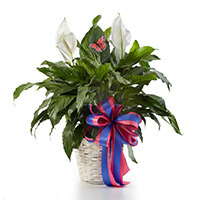 The Rossitto Family purchased the Classic Peace Lily for the family of Claude J. Violette.